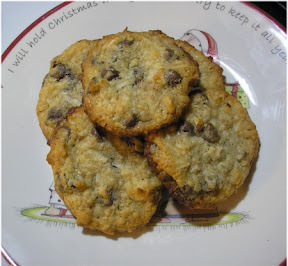 I posted this recipe years ago after visiting my girlfriend in Minnesota and pigging out on her cookies. I never asked if she noticed how her cookie stash seemed to diminish every time I “went to the bathroom” or “got a drink of water.” It is probably a good thing that I forgot about them for a while because they are one of my most favorite cookies in the entire world. Yes, they are that yummy. They remind me a bit of the Girl Scout Samoa cookies. But better. Yes, I said it. BETTER. Again, though, I caution. This is a dangerous dough. Word to the wise – this is an edible batter. There are NO eggs in it. For cookie dough eaters, your moment has arrived and you will be in grave danger of having a very small turnout of actual baked cookies if you do not restrain yourself. Don’t say I didn’t warn ya, sista-girl. Mix crumbs, flour and baking powder in one bowl. In another bowl, beat butter and milk until creamy; add to crumb mixture and combine. Add coconut, chips and walnuts; combine. Place tablespoon-sized balls on cookie sheet about 3 inches apart. Bake for 10-12 min @ 375 Be cautious in the baking process, these will go from good to burnt rather quickly… take them out when the edges are browned and the top starts to look toasty. Let cool for a few minutes before removing them. Once finished, box up half of the cookies, and send them via overnight to my address. Gracias. Jaanvi, do you have Nilla Wafers? Or any semi-sweet “cracker/cookie?” You wouldn’t want anything too sweet, because these cookies are very sweet themselves. all right! I will substitute it with some plain crackers. I do NOT need to make anymore baked goods for Christmas (I’ve made plenty! ), but I have all the ingredients for this, my sister is stuck in DC ’til tomorrow, and I am SO tempted! They’ll love ya for it. Jaanvi – let me know how they turn out. Mary – Funny you should say that. At my friend’s the other night she offered me some of her Magic Bars. I was like, “No way! ?” and asked her the ingredients – just like you said – the same thing. I’ll have to try making bars sometime. Popular recipe. I just re-discovered you from Robyn’s site. I’ve been making these cookies since you posted the recipe YEARS ago. They are wonderfl and everyone loves them. I leave out the nuts, though. Glad to find you again. I’m a fellow Wisconsinite – Kenosha. They are a good recipe, aren’t they? I did end up making them into bars (a bit of a time-saver) and they were just yummy. Dangerously yummy!!! Pingback: Groovy Mom - Striving for SIMPLICITY... one day at a time.